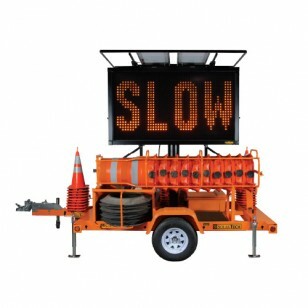 This trailer has been designed to accompany personnel to on-site incidents where advance notice or warning is required. Along with programmable message board, this trailer can carry pylons and essential tools for traffic direction and lane closures. All aluminum, modular construction with polycarbonate non-glare panel face. The Mega-Touch Control Console is a an easy-to-use waterproof, backlit, full colour display with intuitive icons for programming the display board . Select from pre-programmed messages or program your own and control the time and date of the display using the real-time clock/calendar system. Display up to 12 characters per line with a maximum of 4 lines and the ability to select from 12 font types. Character height ranges from 9” to 46” with full animation via amber LEDs that put out up to 10,000 candle power per square meter.